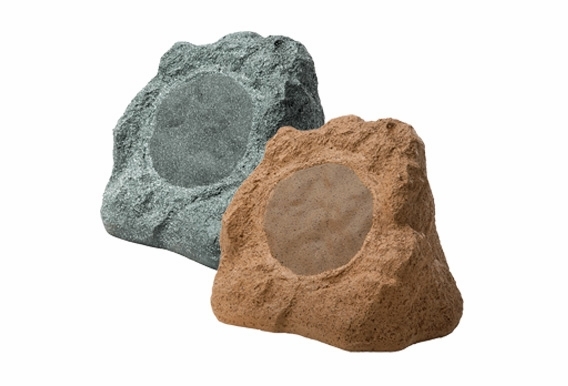 The RS790JR is a single rock speaker and a great fit for spacious backyards and pools. This stealthy model includes 150 Watts of power and has an 8-inch woofer for exceptional coverage and bass response. These are important features if your outdoor music has to compete with ambient noise like splashing from the pool or traffic noise. Customers typically purchase two or more to cover areas as large as 1000 square feet. Features · Aerospace-grade weather-resistant material ensures protection from water, salt, pool chemicals, etc. 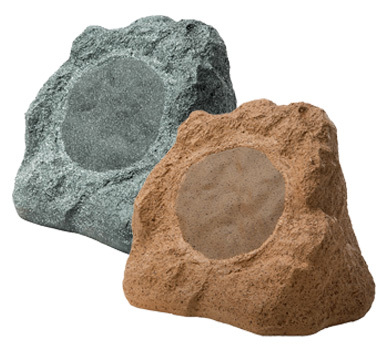 Weather-Resistant Enclosures Customers often ask us if our outdoor rock speakers can handle the elements. OSD Audio rock speakers are engineered specifically for even harsh weather with durable aerospace-grade, multi-layer composite cabinetry that can take heat, cold, wind and rain. Rock Speaker Installation Tips Installing rock speakers is easy and can be a lot of fun. First, decide where you want your new rock speakers to go. Most of our customers like to hide them in landscape border areas or garden beds. You'll need to run outdoor speaker wire from the speakers (all our rocks include a 3-foot speaker lead) to a sound source. Most outdoor speakers are passive devices, which means they do not have built-in amplification and will need a source of power. You can connect your outdoor speakers directly to household amplification like a home receiver or outboard amp/receiver stored safely in a tool shed or other covered space where it is protected from the elements. The OSD team recommends you bury wire 4-6” underground so that it's not visible nor pose a danger of somebody tripping over it. What kind of cable do I need? Direct-burial cable is strongly recommended. We offer CL-rated cable that can withstand extreme weather conditions and uses twice the insulation of regular cables. I have a 18x36 rectangular pool and want to fill the pool area with clear sounding music. I don't expect MEGA BASS but would like to hear low frequency. I have had a Few TFS12CN rocks from TIC and was not happy with the sound they have a very muddy sound and the material they use is vey light weight and seems to vibrate and distort the sound. I also owned Niles RS5 and SpeakerCraft Ruckus 6 Ones which sound great for a 5.25" and 6.5" driver, but are a bit more than I want to spend. I was wondering what the sound quality and coverage of these are compared to the RS690, RS680 and RS670. How many would I need of each to fill the area with clear sound played at a reasonable volume. I have 2 runs of 12/4 run through 2 VMS300 Volume controls and driven by a Sherbourn PA1845 45watt/CH amp. Would you recommend these speakers or something else I am not opposed to mounting a patio speaker on a post I have done it before and the sound seems to typically better than a rock. What is the difference between the RS790 and RS790JR speakers?